Today’s Eye Candy Friday post is brought to you by Dale. He picked a huge bouquet of sunflowers for me when he went to get the vegetables from the CSA this week. And now you get to enjoy them, too. Beautiful! I’m hoping for some at our CSA pickup this afternoon. Have a great weekend. Dale has a good eye … they’re beautiful. Now that’s a flower that evokes fall! It’s a beauty! GAHH!! NOT SUNFLOWERS!!! NOT MORE SUNFLOWERS!!! I love sunflowers. Have a great weekend. Gorgeous! Sunflowers always cheer me up. And I needed a little cheering this morning! I’m a little behind, but I just want to say I think your triangle shawl turned out beautiful, even if it is a tad small! And the baby sweater is too cute! I think he might be kinda sweet on you 😉 Thanks for sharing Dale!! Ah, I will show this post to my husband and elbow him a few times. Thanks, Dale, for the lovely view of summer. Gimme a D!… Yaaaaaay, DALE! I just love the center of that sunflower! It looks like it has little beads coming out of it. Pretty. The two we had come up were accidentally weeded by the landscaper dude. I picked sunflowers at my CSA today! They’re such a happy flower, I love them. Wow! I love this … gorgeous! Happy Belated Birthday Hannah! You are such a beautiful young lady, and obviously your Mom & Dad think a lot of you to trick you in such an EVIL way!! Enjoy the concert! 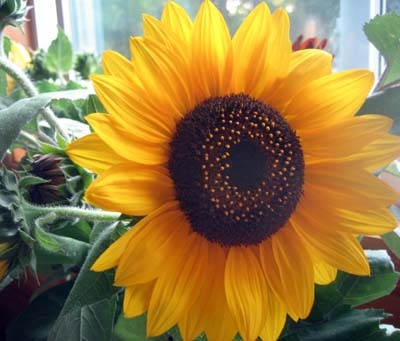 Nice going Dale…love the sunflower bouquet! Hey, Parrothead, I saw on Dave’s blog that you are off to see the lizzard! I love Jimmy Buffet concerts. The audience is part of the show. What are you wearing? The baby sweater from yesterday is darling. Have you tried the free pattern on Knitting Pure & Simple’s site? I think it has raglan seams, and it has a hood. It’s really cute in the pictures and the gauge is 5 stitches per inch, so it would be quick to knit. I have a Hannah too, but she’s a little dog. She is six years old and a Yorkie. I think Hannahs are supposed to be girly and feminine, but mine is a holy terror. I should have named her “Spike.” (My friends have nicknamed her “Satan on a Leash.”) I like her anyhoo—she’s very lovable when she’s not biting.